So, FINALLY I have managed to do a new blog post...it's only taken 6 months! Shameful, I know. In the midst of working and working out and general life getting in the way I have been incredibly bad at keeping the blog updated. Anyway, all day at work in between the stress of doing two jobs and training someone new, all I could think about was how I couldn't wait to get back into my kitchen and what I would make for dinner. Don't get me wrong, that kind of feeling is a daily recurrence but today the thought of finally getting home was the only thing getting me through a day of interruptions, investigations and letters...the endless letters! 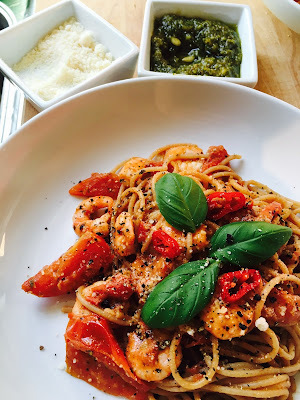 I bought a new basil plant last week so thought I'd go for a pasta dish with some fresh pesto...and if I was doing pasta it would have to also include a tomato sauce and king prawns. 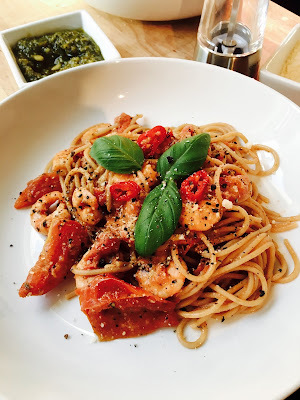 So here it is, King prawn pasta with pesto, tomatoes and chilli. This is so easy and it's a perfect midweek dinner. This serves 2 adults so just adjust the quantities for how many mouths you have to feed. First of all, make the pesto. Add the toasted pine nuts, garlic, basil, Parmesan and olive oil to a food processor and blitz until...well, until what I'd describe as "bitty" - so in between chunky and smooth. Set aside. Add about 2 tablespoons of the pesto you made earlier and stir. 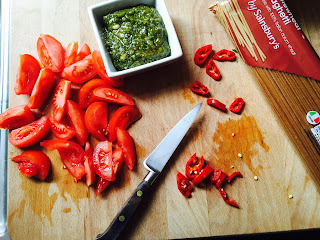 When the pesto is combined, add the king prawns and the salt and pepper. The sauce will then cook on a moderate heat for about 5 minutes, or until the prawns are cooked through. Add the spaghetti to the sauce, give it a good stir and then serve in some bowls, topped with some more grated Parmesan and some fresh basil leaves.